The low-snow winter of 2015 had me frustrated. Thanks to snowmaking, the home skiing at Mission Ridge was tolerable but, frankly, most of the skiing around Washington was poor. North of the border, however, the precipitation we’ve received as rain has come as snow falling softly on cedars. 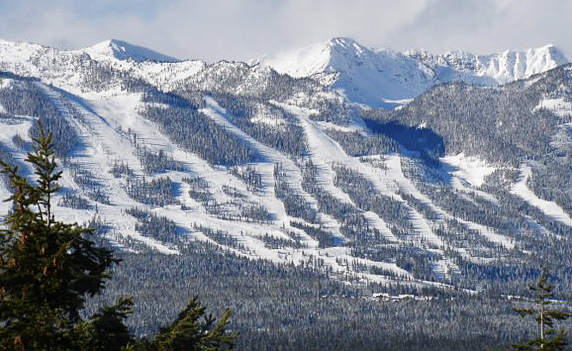 In many places the Canadian snowpack is normal so the real problem is how to decide. 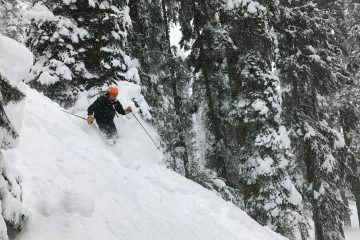 Do we want the mountain with the best powder (Red, Whitewater, Revelstoke), best Nordic and Alpine combo (Silver Star), sunniest weather (Apex, Sun Mountain, Panorama), most demanding terrain (Kicking Horse, Fernie, and Revelstoke), or prettiest women? 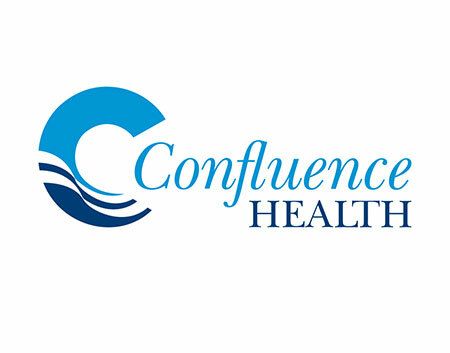 In the end I choose Kicking Horse, because of its numbers. It’s got twice the vertical and 2.5 times the acreage of Mission. On a normal year it’s got twice the snow of Mission – this year it has four times the snow. It’s also got five times as much steep terrain. Finally, it’s been ten years since I’ve skied it. I call my friend and local skier, Matt Dahlgreen, and we decide to pay a visit. Matt’s a better skier than me but he’s also more anxious. Today he’s obviously fighting mental demons as we ride the gondola from the base of Kicking Horse to the top station, a ride spanning the resort’s 4,100 vertical feet. This mountain is shaped something like a closed fist with the palm down. The knuckles are the peaks, the dimples between knuckles are the bowls, and the fingers of the fist are the east-west ridge systems separating the bowls. Drop off the fingers in one direction and you ski north-facing slopes into the bowl below; drop off the opposite side of the finger and you ski south-facing glades into a different bowl. Our mutual friend, Jake Birchard, skis the mountain often and during our first gondola ride up he’s reciting the names and the allure of dozens of steep lines we might sample today. He’s also pointing out dozens of lines the locals ski that, for us, are synonymous to suicide. The drops within our ability, however, are plenty menacing. Most of the entrances to the lines Jake thinks we should sample are scary steep and, given today ‘s firm conditions, a botched turn at the top may result in a rapid slide that will deposit a botched body at the bottom. Meanwhile the lines we won’t ski usually entail jumping outcrops and/or straight-lining chutes to access slopes where we can actually imagine making turns. Twenty years ago only a handful of Old School skiers would call these lines skiable. Now they are common fare for New School hotshots. Matt’s teeth are clenched and his gaze is somber – he’s wondering whether following Jake will end with an ambulance ride. For both Matt and me, much of the day ahead proves to be a case of sideslipping for life. During our first plunge down Jubilee, the initial turns are dizzyingly steep on very firm, packed powder. The snow takes an edge but an unplanned slip onto nylon ski pants will result in a zip-line descent of some 600 to 700 vertical feet. After 4 or 5 turns, which feel like giant sideslips rather than giant slalom turns, the slope dials back enough to alchemize fear into fun. This pattern keeps repeating itself over the hours ahead. Jake leads us to the edge of a precipice. “Don’t go straight down,” he’ll say pointing with his pole. “See how the slope rolls over a little cliff?” Those words will form dark clouds on Matt’s brow. “Take a few turns, and then traverse left into that slot,” Jake will continue, while moving his pole to a new target. Then, before mutiny can form in the ranks, Jake will drop off the lip, make a few turns and work left. No sweat– a textbook demonstration of what’s expected. Matt, with his please-let-me-see-my-wife-again look, will follow. Then I will bring up the rear silently, whistling Gordon Lightfoot’s Canadian Railroad Trilogy — a song these mountains bring to mind and one that quells my mind through distraction. The Stairway to Heaven Chair services two of the four bowls forming the top of the resort but many of our ridge drops deposit us below the bottom station of that chair. That means many of our forays leave us skiing the entire 4,100 vertical feet back down to the base of the gondola. Because it’s been many days since the mountain received fresh snow and because some of the recent days were warm, the lower half of the mountain is armored in ice our ski edges just barely penetrate. On the razor’s edge between controlled turns and wild sideslips, we plunge downward. 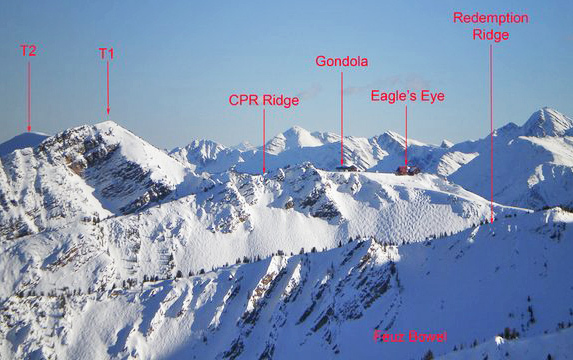 Many of the ‘intermediate’ blue runs on the lower mountain like Kicking Horse, Wiley Coyote, Grizzly Paw, Buffalo Jump, and Big Ol’ Bear, might be rated black at Mission so we dub them purple. This is also descriptive of what our sides might look like if we lose a ski edge and give the slopes a Canadian hip check. She’s cute and I want to follow her, but Jake is beholden to a colder mistress. Whereas Monique exits left at the top, Jake branches to the right and soon has us gliding down CPR Ridge and standing above Derail. Matt and I share a half smile — we are gaining a measure of confidence that, in our own wild and unsightly ways, we can navigate these slopes without causing a train wreck. Much farther down, we finally find ourselves on Gentle Ben, a green cruising run that has actually been churned with grooming machines and allows us to effortlessly sink an edge in it. “Thank God!,” Matt yells, “Please give me more easy cruising runs!” His prayer falls on deaf ears and we ride the lifts back to the steeps up high. Only later when I study the trail map do I notice there’s not a single intermediate line down Super Bowl, just two single-diamond runs and a hail storm of double-diamond routes. Nonetheless, Matt and I bite on bait and off we go. We choose a line that’s only half intimidating and are managing it well until, halfway down, the light goes flat. What had been fun becomes disorienting. We survive the bowl and move into the aptly named Crazy Legs, a black run with big frozen bumps that go on, and on, and on… The light is flat and the moguls bash me around like bumper cars. Eventually that run ends and we peer down another steep bump run, also appropriately named Terminator. The bumper car treatment continues and our legs get pushed beyond crazy into the realm of rubber. Finally we hit a gentle cruising run traversing back to the gondola. “I’ve rediscovered the joy of groomers,” Matt tells me as we glide side by side. We catch up to Jake who stands straight and strong on steel legs while we wobble beside him. “We have time for one more top-to-bottom run,” he announces. Details, Details: Skiing Kicking Horse Mountain Facts (as of 2015): 300 inches of snow a year, 2,825 acres of terrain, 4,133 vertical feet of gain, 4 large bowls, 85 inbound chutes, 128 named runs, 20 green runs, 16 blue runs, 38 black runs, 61 double-diamond runs, 60+ unnamed triple diamond runs, $91/day for adult lift ticket, 1200 ski-in-ski-out beds at the base of the mountain, 6 on-mountain restaurants. 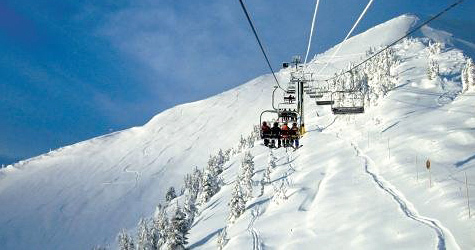 The ski hill operates until mid-April. 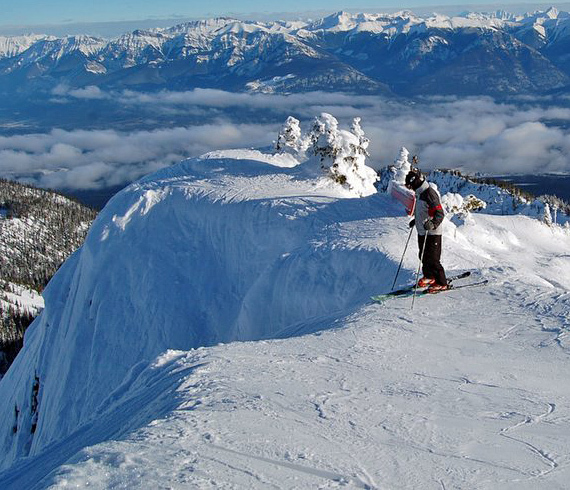 Kicking Horse frequently makes the list of compilations discussing the best ski hills in North America — but there’s usually a proviso about it being a skier’s mountain and not for the faint of heart. 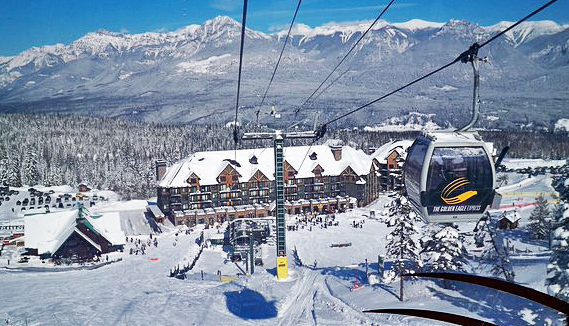 Ski Hill History: 1986 community ski hill of Whitetooth opens; 2000 Ballast Nedam (a Dutch construction and engineering company) purchases the mountain, renames it Kicking Horse, and builds the gondola, Eagles Eye Restaurant on top, and the Catamount Chair at the base; 2002 the Glacier Inn (hotel) opens at the base of the resort; 2003 Stairway to Heaven Chair is built at the top of the mountain; 2004 Feuz Bowl opens; 2010 Super Bowl opens ; 2011 the ski resort and many of the real estate holdings at its base sell to The Resorts of the Canadian Rockies (a company that also owns the ski areas of Fernie, Nakiska, Kimberley, and Monte Sainte Anne). 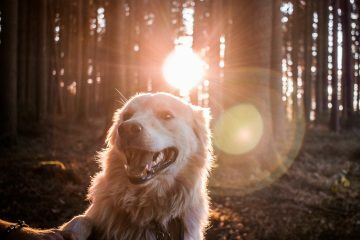 About Golden. This town of 4,000 people, located 8.5 miles from Kicking Horse, bases its economy on resources (logging, mining, lumber mill) and transportation (Trans-Canada Highway and a rail yard). Many tourists pass through Golden while traveling to Glacier National Park/Rogers Pass to the west and Banff /Yoho national parks to the east. Between hotels, motels, inns, and lodges, the town and outlying area have slightly over a thousand rooms for rent. There are also roughly 20 different dining options between independent restaurants and fast-food chains. While the town has the amenities you might expect – gas, banks, grocery stores, sports stores, coffee shops, liquor store — it’s a working town that hangs its hat on substance rather style. Visitors looking for charming architecture, trendy boutiques, and hipster pubs are likely to wonder how this leaden town got its name. 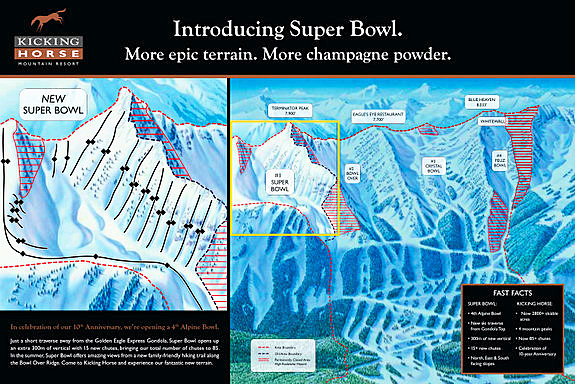 The mountain, however, will not disappointment high-end skiers. Access. 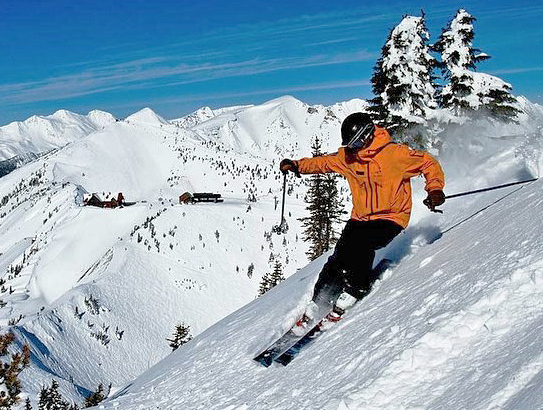 The drive to Golden is shorter than what many skiers suffer visiting such resorts as Sun Valley, Idaho or Big Sky, Montana. The shortest, most spectacular route (8.5 driving hours from the Wenatchee area) is to follow Highway 97 north across the border and then to Vernon. Slightly past Vernon, take Highway 97A northeast to Sicamous, and then Highway 1 east to Golden. If roads are snowy, the easier but longer drive (9.5 driving hours) follows I-90 east to Coeur d’Alene and then Highway 95 north to Sandpoint, Bonner’s Ferry, the border crossing, Cranbrook, and Golden. Visiting Canada. Many skiers are reluctant to cross the border, but it’s surprisingly hassle free if you don’t have a criminal record, a string of DUI’s, drugs in your luggage or firearms in the car. You simply need a valid passport (or an Enhanced Driver’s License). There are some restrictions on which fruits and vegetables and how much liquor you can bring. All those details here. More Information. Mountain details about the skiing. Town details here. This article was originally published on 3/12/15.